If you already tried DentaSoak and already have the special Soaking Bath that comes with the DentaSoak Starter Kit, then you can save with these Refill Kits. The Refill Kit does NOT come with the soaking bath; it contains only a 3-month refill supply of the liquid and powder DentaSoak packets. IMPORTANT: If you have never used DentaSoak previously, then you should buy at least one DentaSoak Starter Kit which contains the soaking bath. If you mix DentaSoak in a different cup, the manufacturer does not guarantee its germ-killing or cleaning effectiveness. DentaSoak persulfate-free retainer, denture, and dental appliance cleaner is a combination of two types of ingredients: a liquid and a powder. To use DentaSoak, mix the liquid packet together with cold water, add the powder packet, then close and gently shake the soaking bath. Once the solution is mixed, it lasts for ONE WEEK. Each DentaSoak Refill Kit includes full instructions and enough solution-making packets to last 3 months. It's great for all types of removable dental appliances, such as retainers, aligners, mouthguards, snoring and apnea devices, and even dentures! To buy a one-year supply of DentaSoak Refills (4 boxes - your best value), just type in a quantity of 4. You get one three-month supply of DentaSoak, plus full instructions. Please note: To use the refill, you need a mixing cup, which is available with the Starter Kit. The refill does NOT include the mixing cup. Each mixture lasts for one full week. Safe for all types of dental appliances: Hawley retainers (metal and plastic), Invisalign, Essix Retainers, Bridges, Partials, and even Dentures! Kills 99% of bacteria and removes white plaque buildup (removal of buildup may take 3 to 4 soakings). The manufacturer advises that you do not soak your appliance more than the recommended 15 minutes per session. I have a retainer that's like Invisalign. Can I leave them soaking in this for a few hours or overnight? I have been using this product for a year now and I'm really happy with it. My retainers used to have those accumulation from, mistakingly, using toothpaste to clean my retainers. Now I have clean and clear retainers that look brand new. eat, keeping them cleaner and fresher. I took off 1 star because it is a little messy to mix. This was the product my dental professional recommended for the mouth device I now use to treat my sleep apnea. The website is easy to navigate for someone who is phobic about ordering products online (me) and delivery is super fast and efficient. I appreciate the helpful emails and reminders as I am a new user of the mouth device and your cleaning products. Good, easy to use product for dental appliances. ProsEasy to use and pack. ConsQuantity of powder per packet seems small for a week of use, so I change the ingredients more frequently. If it is heavily concentrated and fully effective for a week, then no cons. I purchased this product as recommended by my dentist and I would also recommend it. Best dentasoak I've ever had for my retainers. Gets the white stuff off really, really fast! 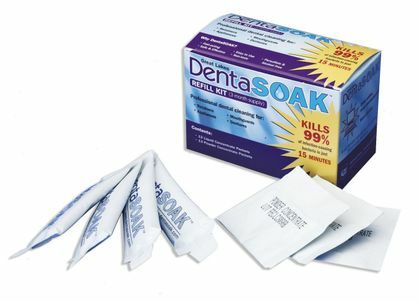 Denta-soak is a convenient retainer cleaner. It is easy to order online, delivery is prompt, and it keeps my retainer clean and fresh. ProsConvenient: order online, home delivery, and a quality product. The product works well enough, but what the ingredients are is a big secret. For the sensitive people....shame on you for not sharing this info. Aren't you legally suppose to let us know what is in there? Merchant Response:We understand your concern, but we merely sell the product DentaSoak; we do not manufacture it. The manufacturer does not share the ingredients list with anyone. Therefore, we do not have a list of ingredients for DentaSoak. ProsDoes a pretty decent job. ConsIf you leave them in too long they will turn blue and you'll be spitting blue in the morning. You have no idea what the ingredients are!!! ConsComplaint: Shipping is 50% of the cost of the refill. Perfect choice for cleaning my night guard! Easy to use. Easy and efficient purchase and delivery. Will definitely order again! I needed a product to soak and clean my Invisalign retainers and bought the dentasoak; very simple to use and works great!! I find DentaSoak to be superior product compared to dental tablets for use with my oral appliance.Thanks! This product is effective but is overly priced. ConsIt is a little cumbersone to open the two elements and mix. The container leaks in transport. Great product. It does all that it claims to do. I hated the white build up that was growing and growing on my retainer that is years old. After using this product for a couple of weeks, my retainer looks brand new! It is easy to use, too. Soak the retainer for 15 minutes and it will look better and better each time. I love my retainers, wear them all the time, and the cleaner keeps them nice and clean. Retainers are way expensive and I am very picky about them. This is the only thing I will use to clean them. ConsDon't overfill the cup or it will spill out when you dunk your retainers in. works great. keeps my oral device in perfect shape. Unless you want to keep replacing the rubber bands on the appliance, don't leave it soaking all day! Does a great job sanitizing my dental appliance. I love that this product is used for a week at a time. It's very convenient and works well. I found it is keeping my invisaligns cleaner than anything else that I have tried. I have been using DentaSoak for my retainer daily for the last several years. It works well to prevent staining or white buildup. I also like being able to use it for a week before changing the solution. Good product. ProsOdorless, lasts a week before having to change solution, easy to mix, keeps white buildup to a minimum. Having essix retainers for about 2 weeks after orthodontic treatment, I noticed the white build-up on them. My orthodontist actually recommended cleaning them with toothpaste, which is what I did until I read about certain ingredients that can degrade the retainers over time, so I quit doing that immediately. I just used plain warm water for a few days then added the Cleanse.Freshen.Go spray until the DentaSoak cleaner arrived. After about a week of morning use in an ultrasonic cleaner, DentaSoak removed the white build-up! Now my retainers look like new again and have stayed that way with regular use. For me, this method worked better than regular brushing with the Clean.Freshen.Go spray. NOTE: my retainers did (somewhat) stain blue after accidentally letting them soak >15 minutes, but it rinsed right off under warm water, no brushing required. They also had a somewhat faint bitter mint taste that went away after a few minutes in my mouth, which only happened after the accidental long soak. I have been using DentaSoak for at least 5 years. It cleans throughly and oral appliances are kept bacteria free and fresh. This is the best Invisalign cleaner I have found. I have tried Retainer Brite, Sonic Brite and OAP gel and foam. All of them clean the crud off of them and leave them clean but DentaSoak actually removes at least part of the coffee stains that happen if I forget to remove them before a coffee. Maybe not all of it but it does make a difference. I have soaked my test Invisalign (my first tray that I soaked in straight coffee to see if anything would help) and it really did. I soaked it overnight and it got a bit stained blue but that cleaned off with a brush and OAP gel and it was definitely less stained. I think it might be the blue color, just like bluing my grandmother used to whiten laundry. And add to that you only need to mix it up once a week, I really like it. I used it in an ultrasonic cleaner, too, as I did with the other soaks so I think it is the blue that makes a difference. I've had problems in the past with my retainers having a hard, white film build up on them when I cleaned them with just soap and water. When I got a new pair of retainers, I decided to look for something else I could clean them with so they wouldn't develop that buildup. I tried this and since using this, my retainers have never gotten the white buildup. It leaves them very clean and sparkling. And I like that it doesn't have Persulfate. Just soaking my retainers for 15 minutes a day in Dentasoak is so effective in keeping my retainers "squeeky" clean. I love that it does not have extra additives or harmful chemicals. It's so easy to mix up a new solution of Dentasoak once per week. I'm very happy I found this product. ProsEasy to use and very effective in keeping retainers clean. I sent away for this product because it is persulfate free and safe for retainers with solder. Some cleaners for retainers and dentures cause solder to fall apart over time. This product works amazingly great with an ultrasonic cleaning machine. With repeated use, my six year old retainer looks like new! Merchant Response:DentaSoak is safe for retainers with solder; however, please make sure to follow the manufacturer's instructions and don't soak your retainer longer than 15 to 20 minutes. If you regularly soak your retainer too long, it could affect the solder over time. Both of my sons use this, and it has been very effective at keeping their retainers in good condition. We plan to continue using it. This is any easy method to keep my retainers clean. Great product for various appliances! This product is mild enough not to harm your appliance yet effective enough to clean it and keep it fresh. Stock up for my Dentasoak kit. Prices are better in bulk.